Just like on the other main Hawaiian islands, the weather on Oahu's south and west shore is usually drier and sunnier than on the island's east shore. That's because the predominant tradewinds are blowing from the northeast about 90% of the time and these winds bring moisture with them. As these moisture-laden clouds approach the islands, they get stuck on the mountains, where the moisture comes down as rain. The weather on Oahu's windward (east) shore is therefore usually a lot wetter than on the leeward (west) shore. But thanks to the rain, the windward coast is green and lush while the leeward coast is dry and has no rainforests. Waikiki, a Honolulu neighborhood, is where most visitors to Oahu are headed since this is where most of the accommodation options (hotels and resorts) are located. Waikiki is on Oahu's sunny south shore. It is sheltered from most rain clouds by the Ko'olau Mountain Range. These mountains are visible from Waikiki. On most days of the year one can see grey or dark clouds hanging over the tops of the mountains. But not to worry, the clouds usually stay right there and with them the rain. And when it does rain on Oahu's south shore, it is usually short-lived. 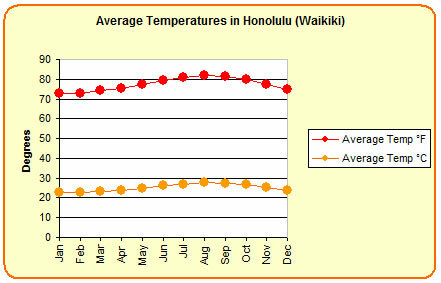 Here is an overview of Honolulu's year-round temperatures. Oahu's average ocean temperature is around 75°F (24°C) in February and 80°F (27°C) in September. Vog (volcanic smog) is much more common on Hawaii's Big Island than on Oahu since the Big Island is the only Hawaiian island that still has active volcanoes. Occasionally when the winds are blowing from the south (known as Kona winds), the vog from the Big Island's volcanoes affects the air quality of the other Hawaiian islands, including Oahu.